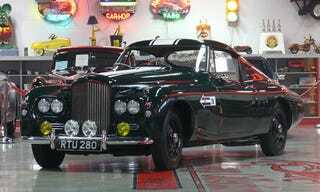 One may think that Bentleys were only used for chauffeur duty during the 70-some years between the 'Bentley Boys' of the 1920s and the 2001 EXP Speed 8 LeMans prototype racer. But this 1954 Continental R proves that simply wasn't the case. It's a one-off racer with a very distinct long-tail body. It seems unusual that someone would worry about aerodynamics on a car with such an upright front like this Bentley, but you can't deny that whoever campaigned this machine certainly had distinct taste. If your pockets are deep enough (or your organs are valuable enough), the car can be all yours. Though it's probably more practical to just bolt a turbo to a Rolls-Royce Silver Shadow.